The “Heritage of Mercury. 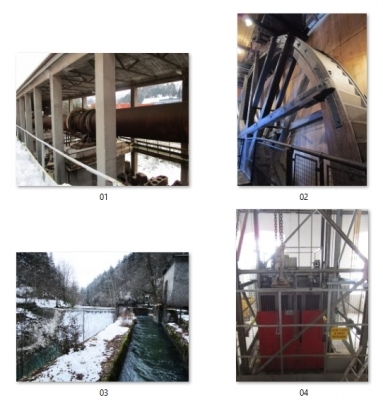 Almadén and Idrija” consists of the two largest mercury mining sites in the world. They produced the metal over a lengthy period, the Slovenian Idrijia often serving as a back-up for Almadén in Spain. Mining stopped here in the late 20th – early 21st century. Mercury was used on a large scale from mid-16th til 19th century by the Spanish in the New World in the process of extraction of silver. It is a relatively rare metal, and dangerous to handle. The inscribed area also includes the town centres of Almadén and Idrija. There related buildings such as a Mining Acadaemy (Alamadén) and miners’ theatre (Idrija) can be found. I visited the Slovenian part of this WHS. Idrija lies just enough off the beaten track to be an authentic surprise. The town has a certain cuteness that stems from constructions that were made during the mining boom of the last centuries. As a reminder that this is no open air museum, this is mingled with some communist-style housing blocks and rather busy traffic. Best though is its natural setting: in a valley surrounded by green mountains on all sides, with a river and streams running through town. I could not find a parking spot in the city center, so I left my car at a supermarket on the outskirts of town and had a pleasant walk along that river into the center. First stop on my sightseeing tour was the Gwerkenegg Castle. Though it looks like some feudal lord lived in here, this Renaissance building was made to be the administrative headquarters of the mine. It now houses the excellent town museum. Entrance costs 3.5 EUR, and includes a booklet in English detailing all rooms. In one of the first a bowl full of mercury is shown, with an iron ball floating in it (mercury is 2 times heavier than iron). Interesting stuff. Other rooms include one full of black-ad white photos of daily life in Idrija in the early 20th century. We see girls lace-making at school, that other craft where Idrija is famous for. The women in town started doing this to earn some additional money to their husband’s miners wages. Unfortunately no other mine-related sites are open to the general public, you’ll have to arrange for a tour somewhere to visit for example the pretty miners house above town (see 3rd small picture). It looks quite big, but several families lived in it. The town center is worth a stroll for seeing the opulent Town Hall (1898) and little Mine’s Theatre (1769). For lunch I had the local žlikrofi with Gorgonzala sauce on top, very filling. I then had to kill some time before the 3 p.m. tour at the Anthony’s Shaft would start. I had seen about all there is to see in this small town, so I just enjoyed the sun and a cappucino on a terrace. In the end I was glad that I had waited for the tour to start, as this is where the mercury mining history comes alive. In all it takes about 1 hour and 45 minutes, of which you spent over an hour underground. I found the guide very good, explaining each element clearly in both Slovenian and English over and over again. I was in a group of 10 tourists, from all over the world including a couple from Iceland. Of course during my WHS travels I have been to many mines before: gold, silver, copper, coal – the list is full of it. I wondered how mining of mercury would be different. Well, it’s pretty similar. They hack and blow away the rocks to get at the precious metal, run little carts on rails to transport the material and build an elaborate underground system. What I didn’t know is that mercury not always comes in the form of little silver coloured balls: 70% of the mercury of Idrija derived from a red stone, which had to be worked and heated afterwards to get to the liquid metal. You can see both forms during the tour, the materials are still present in the mine walls. The mine wasn’t closed because there was no mercury anymore, but the prices had sunken so much that it wasn’t profitable anymore. I spent about 22 hours in Idrija, from 13:30 on Monday to 11:45 on Tuesday in February. It was a busy 22 hours, which made the visit more fun for me. When I got off the bus one stop before the Idrija bus station, the driver asked me where I'm going. I said "To the museum," and he said "The (Castle) Museum is at the next stop." I had meant the Smelting Plant Museum, which the driver was not aware of. As it turned out, the Museum at the Smelting Plant opened only a year before. When I got to the Museum at 13:45, I was the only visitor, and the attendant kindly gave me a tour of the Plant and even served me a cup of coffee while I browsed through the exhibition. I was especially surprised to encounter the section of the exhibition about the mercury poisoning at Minamata, Japan, which I grew up hearing about, and how the problem in Minamata made the difference with regards to mercury around the world, just as the problem in Fukushima made the difference with regards to nuclear energy around the world recently. We humans learn by making mistakes... I spent about 90 min. at the Plant Museum. My next plan was to visit the Kamst before it closes at 16:00. As it turned out, I could visit the Kamst only with a guide from the Museum at the Castle. The man at the Plant Museum made an arrangement for me, and I was told to go to the Castle before 16:00. I left my luggage at my hotel, which was on the 1st and 2nd floors of the Anthony's Mine structure, before heading to the Castle. When I arrived at the Castle, I was again the only visitor, and a girl attendant shut the Castle Museum at 16:00 and drove me down to the Kamst. After that, my plan was to go back to the Castle Museum, which was supposed to close at 18:00. But when I told the girl my plan to walk to Wild Lake in the following morning, she suggested that I go to the Lake right then and come back to the Castle Museum when it opens at 9:00 in the following morning, as the path along the canal to the Wild Lake started right from the back of the Kamst. So I did exactly that. I walked on a path along the canal for a few km to the Kobila Dam, where the water from the Idrija River is diverted into the canal, all of which are part of the core zone. 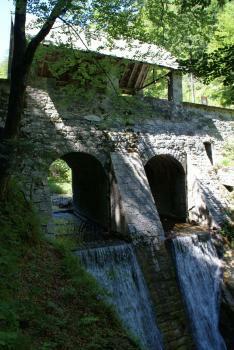 There was a short suspension bridge over the Idrija River, which I used to cross the river to the Wild Lake. The Wild Lake created by a spring did not look as blue as I had heard. Now, with no knowledge of anything, it took me a while to understand the function of the Kamst and how all the mechanism worked together. The water diverted to the canal was poured over the huge water wheel at the Kamst, which operated the whole system at the Kamst to bring the underground water, which inevitably appeared all over the mine, out of the mine and to drain it into the Idrija River. I met a local man at the Wild Lake and tried to see if he could drive me to one of those water barriors / dams further into the woods, but he told me it was not possible due to the snow. But he gave me a lift to my hotel in Idrija. The hotel also had one of the few restaurants that were open in Idrija, and there I had Zlikrofi, the EU-protected local specialty dish. The girl at the Castle Museum had also promised me to see if she could arrange a special tour of the Anthony's Mine after my visit to the Castle Museum at 9:00 in the morning, as the mine is supposed to be open only on weekends in February. She couldn't. But instead she gave me a tour of the Francis' Mine when I was done with the Castle Museum, after again shutting down the Museum at about 10:00. Photo 01 shows the rotating furnace at the smelting plant. Photo 02 is the water wheel at the Kamst. Photo 03 shows the Kobila Dam and the canal. Photo 04 shows the entrance to the Francis' Shaft. I had to catch a bus out of Idrija at 11:45, as I had purchased a ticket for the tour of Postojna Cave TWHS at 15:00 that day. Skocjan Caves WHS is more unusual, but Postojna Caves TWHS is supposed to be the largest in Europe. One more thing about Idrija. It reminded me so much of Banska Stiavnica in Slovakia, which I like so much that I've been there twice. Both towns are about mining, both have a castle / castles and even a Calvary within the core zones! But, even though I had such a good time in Idrija, I have to say that as far as the overall beauty goes, Banska Stiavnica wins hands down. The map in my 1998 (!!) version of Michelin Spain has an enormous area bounded by Toledo, Merida and Cordoba, totally devoid of any sites deemed as being of interest by that august publication - and Almaden lies slap in the middle! Now, to be fair, the mercury mine was still operating then - it closed around 2002 and has since been turned into the “Parque Minero de Almaden”, achieving WHS status in 2012. I don’t know if the latest version still ignores it but I can state that we found the diversion off Spain’s normal tourist route into Michelin terra incognita very well worthwhile. In our (successful!) attempt to take in 30 new WHS on the Iberian peninsular by rent-a-car in 3 weeks we always had to take great care to try to plan around that perennial problem of visiting sites in Spain – the “Cerrado” sign!! It is all too easy to arrive too early, too late, during siesta time or on a Monday or some other closing day. We were also traveling across the change from summer to winter hours. Other reasons for closure of significant sites which we came across during our trip included – an election, a wedding and the guide hadn’t turned up. As with so many Spanish WHS, visits to Almaden are only possible on group guided tours. We were already used to arriving at “opening time”, buying a ticket and then sitting around for an inordinate period waiting until the guide considered that a large enough number of people had arrived to justify him/her spending valuable time leading a tour (which was usually in Spanish and largely incomprehensible to us anyway – and rarely was a handout of the general story line provided in alternative languages as happens in many other countries nowadays). The Parque Minero web site has a complete page on its opening times and rules for operating/not operating group tours and states - “2 daily visits are guaranteed (first thing in the morning and the afternoon)”. A morning tour was essential to us as we planned to drive on to Guadalupe that afternoon, so it seemed that we needed to be at the ticket office by 10 am to try to get on the first visit AND hope that telephone bookings hadn’t already reached the “maximum capacity” (whatever that was)! So we left our previous overnight at Ciudad Real early (luckily, unlike most Spanish hotels it started breakfast as “early” as 7.15!) to drive the 103kms to Almaden in time for the opening at 10 am to ensure we got on what might be the morning’s only tour! Arriving at around 9.45 we found the visitor centre already operating, bought a combined ticket for the mine and the hospital (Euros 13 + 3 less 2 for “jubilados” = 14) and were told that the first tour underground would be at 11. However, the Visitor Centre itself has some displays, and our assigned guide explained these (in limited, but perfectly acceptable for the purpose, English). Of particular note was a 3D model of the mine workings, showing both their extent in terms of depth and their compactness in terms of width and length. Within these limits could be seen the mining locations developed across 2000 years from Roman times, through the Arab period (when Almaden was named and from when the Spanish language later acquired its word for Mercury = Azogue) and into the 16th century (when the demand for Mercury in the Americas emerged following the discovery of silver there) with the use of prisoners and slaves and then through to the end of 20th C, going ever deeper as technology improved - eventually reaching 700 metres. Within this small area “The mercury deposits of Almadén (Spain) have the greatest concentration of this liquid metal on Earth. Its production since historical times has been estimated in approximately 250 000 MT of metal, which represents about one third of the total mercury used by mankind throughout history”. A second display of interest was an artwork of liquid mercury (well encased in thick glass to prevent the escape of poisonous fumes!) above which is placed a photo of the Sculptor Alexander Calder standing alongside Picasso at the Spanish Pavilion at the Paris Exhibition of 1937, both looking at Calder’s own artwork “Mercury Fountain” created for the Exhibition as a tribute to the people of Almaden who had been besieged by Franco. (Picasso of course had “Guernica” on show on the same floor as another anti-fascist art work!). Calder’s fountain can still be seen (now also well protected) in the Fundacio Miro, Barcelona and there are several Youtube movies on the Web of it operating and showing the word “Almaden” both carved into the stone base and as Calder’s “trademark” - a kinetic “mobile”. (Calder has a connection with another WHS – his acoustic “Clouds” are in the Aula Magna at Caracas University). When we eventually set off on our tour “proper” we were still only 2 with our guide – as far as we could make out there were no other visitors that morning (End Sept 2015). What would have happened “language wise” if some Spanish visitors had turned up I don’t know. In fact we became rather sorry for all the people working hard at the site trying to provide a good experience. OK, we were there on a quiet day at the end of the season but, we were told, the hope had been for around 100k visitors pa and they were only getting around 15k - and these figures include what are probably quite large numbers of Spanish school children for whom parts of the exhibitions were clearly devised. Several other guides were standing around with nothing much to do (we were to see them later as they came out to drive our transport back to its starting point) and there was a cafeteria empty of customers. In its later years of operation the mine was run by a Spanish governmental company (See //www.mayasa.es ) and, since production ended, this appeared to given a new role of estate management including developing and running the park – we got the impression that the guides etc were working on with their old Ts and Cs.from when the mines were working. The official visit commenced in the “Mining Interpretation Centre” (converted from the Compressor building) where, as the Web site says, “indispensable prior knowledge will be given on the historical evolution of mining work”. This consisted of a series of stands explaining, via PC driven videos, the development of the mine across all those centuries and levels and the changing technology which permitted mining at greater depths and volumes, together with processing of the ore. It turned out that our prior knowledge of the acquisition and processing of mercury was hazy at best - and the filling of this undoubted gap in our understanding of one of the World’s historically important metals was a major plus point for us of the visit. Outside this museum is the “jewel in the crown” in terms of the Industrial Archaeology at this site - the “Forno Bustamante” – a, largely original, Mercury furnace from 1720 which has somehow survived (Photo). 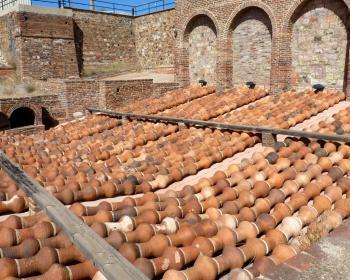 Named after one Juan Alonso de Bustamante, who brought new technology from Huancalica in Peru which utilised clay pots, each with a hole, arranged in rows. These enabled the condensed mercury vapour created by burning the crushed cinnabar to “drop out” for easy collection, fully separated from the slag and with no need for human intervention – unlike earlier methods. This raises the issue of the nature of this transboundary “dual” inscription which had originally been intended to cover 4 sites - Almaden, Idrija, Huancavelica and San Luis Potosi but “lost” the latter 2 during the run up to nomination! During our visit almost no mention was made of Idrija by the guide or any of the displays. 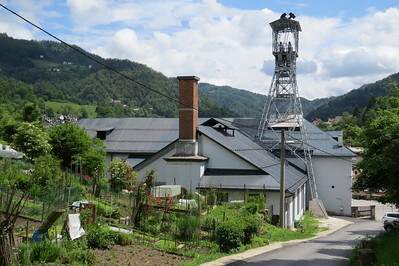 The picture I gain is that Idrija is, historically, somewhat secondary to Almaden – it lacks Almaden’s 2000 years of mining history as mercury was only discovered there in the very late 15th C. Its ores were less rich and the volumes produced were considerably lower than those of Almaden and it was not in the lead technologically. I haven’t visited Idrija so can’t directly compare the 2. From the AB evaluation I get the feeling that a lot of emphasis is placed on Idrija’s “water control systems” (pumps and several dams!!) which were not an issue at Almaden but provide the opportunity to claim the need for both sites for “completeness”. Each includes some mining-related aspects from inside the town in addition to the mine workings themselves - but both towns receive only faint praise in terms of what remains. Whatever – ICOMOS, in its wisdom, concluded that the pair justified a serial inscription (“ICOMOS considers that the selection of the two sites in the serial nomination is justified by the comparative analysis, particularly bearing in mind the specific nature of mercury extraction in the context of general mining history, and the importance of the two sites in this field” - though I can’t say I find the argument convincing. Which leaves the other 2 sites originally identified. Our Guide at Almaden indicated that San Luis Potosi (SLP) dropped out because of the problems created by the continuation of Silver mining there whilst Huancavlica did so because of governmental problems in the area. After the Mercury Museum, we were returned to the Visitor Centre by electric car. It was now 13.35 and it turned out that the Hospital would close at 2pm thus not leaving enough time to see it before lunch, and wouldn’t reopen until 16.30 before which we had to leave - “We normally expect visitors to stay the day” we were told!! We were given our “Hospital” ticket money back and set about a quick tour of the town whilst Spain had its lunch/siesta. I am rather amazed to note that the only photo of the entire site on the UNESCO Web site is of the floodlit Puerta de Carlos IV at Almaden (with nothing from Idrija) – hardly the site’s most important aspect – this neoclassical gate, built in 1795 "ejemplificaba con su prestancia el importante producto que se obtenía en el interior de los muros”. A series of boards around the town of Alamden show 6 elements in addition to the Parque Minero - Castillo de Retamar, Casa Academia de Minas, Puerta de Carlos IV, Real Carcel de Forzados (Old prison – which was demolished in 1969 leaving only a partial basement! ), Real Hospital de Mineros, and Parque de Toros, (these cover but don’t exactly coincide with the inscribed locations as listed with UNESCO. The first 3 can be picked up quickly during a short walk from the Parque Minero but really offer very little to see – although the Arab Castillo provides a nice view over the town, mine and countryside . We only saw the hospital from the outside but gained the impression from our guide and photos of its interior that it wasn’t worth waiting 2 hours for – it is primarily yet another museum. The Real Carcel remains are nearby. The one undoubted star of these other elements is the Bull Ring. It is set at the opposite end of town from the mine but is definitely worth going to. It gained inclusion on the basis that the 24 houses which create the hexagon within which the ring operates were built in 1752 to house miners and that the rents helped pay for the hospital. A number of the houses have been turned into a hotel (see //www.hotelplazadetoros.com/index.php?idioma=in ) and we were able, during siesta time, to wander around the interior public areas and gain views of the inside of the Bull Ring with no one around! I visited Idrija, Slovenia in April 2014. I wasn't expecting much as I'm not so keen on industrial WHS. However, I was pleasantly surprised with Idrija. It is quite remote and you won't visit by chance, that's for sure. It's a nice drive through winding roads and it has much to offer even though it appears to be a ghost town now. The industrial landscape is immediately visible with metallic structures, smelting plants, mines and several shafts. I visited Anthony's shaft in time for the 10am tour in English (the other guaranteed tour is at 3pm). The tour in "the second largest mining site in the world" takes around 2 hours including a 20 minute informative video. You get to wear a protective waterproof miner suit and a hard hat before entering the mercury mine. The guide makes the trip interesting and describes the miners' everyday life as well as the different developments over time. The highlight of my trip was actually seeing naturally occuring mercury droplets in the mine as well as getting to appreciate the different structures (wooden and iron) used to support the shaft. For those who are more adventurous, group tours can be organised to go even deeper inside the shaft with torches instead of electricity lighting and going down ladders apart from the 500 stairs you go down in the traditional tour, eventually getting out in the nearby village. The traditional loop was more than enough for me to grasp the size and importance of this industrial site. I would vividly recommend using the hard hat if you're taller than 6 feet ... you'll definitely won't regret it! Apart from the mine, there's a worthwhile hike through the greenery to see the Kanomilja or Ovcjak Water Barrier, the Vojsko-Idrijca Water Barrier, the Putrih's Water Barrier and the Belca Water Barrier. If you have enough time go for it, otherwise I'd highly recommend visiting the shaft and the old town itself, with its church, municipal museum, castle, old cinema, etc. It might be quite difficult to find an open restaurant in the slow months but do try the local speciality "zlikrofi". All in all, I enjoyed my visit even though it isn't one of the most outstanding WHS in the list. After catching the 08.15 bus from Ljubljana station to Idrija, I reached the Antony Mine in time to get kitted up for the 10.00 tour of the mine shafts. The tour descended only 3 of the 15 levels, but the atmosphere was stifling all the same. Down in the tunnels there were several displays showing methods of mercury extraction over the centuries. There was also a rock face with drops of mercury oozing out of it. Like Ian I also enjoyed a plate of Idrija zlikrofi (mushroom ravioli) after the tour. 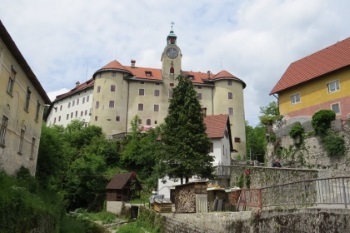 I visited Idrija, the Slovenian part of the WHS, in May 2012, expecting that it would be inscribed a few weeks later. Idrija is a small town with about 6000 inhabitants, 50 km from Ljubljana on the junction of the subalpine and the karst areas. The town lies in a picturesque valley surrounded by forest, quite unusual for a mining town. Mercury was mined for 500 years and until its closure Idrija was the second largest mercury mine, Almadén being the first. The WHS consists of seven parts: the old town, two other sites in the vicinity of the town centre, and four water barriers located in the surrounding mountains. 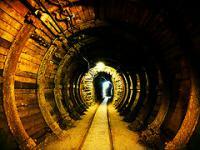 The historic mine, the Anthony's Shaft dating from 1500, is situated in the old town and is open to visitors. The guided tour takes 1.5 hours, it starts with a 20 minute multivision presentation. The oldest mine galleries are narrow and you have to bend down several times, the newer mine tunnels are wider and higher. The different steps of mercury mining and the techniques and tools that were used over the centuries are explained. 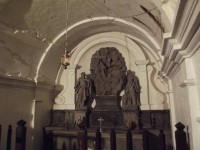 And you can also see the underground chapel dating from the 18th Century. It was interesting to learn about the specifics of mercury mining. The mercury ore deposit is relatively small: 1500 m long, 600 m wide and 400 m deep, just below the town. 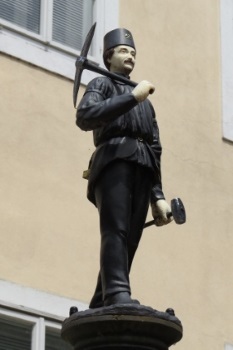 In Idrija the metal was found both in its elemental liquid form and as cinnabar ore (mercury sulfide). However, the tour was very similar to other mining sites, nothing extraordinary. In the old town are several buildings that are associated with mining: the entrance building to the Francis' Shaft (now a technology museum with pumps, engines and other devices), nearby a historic miner's house, the Castle Gewerkenegg (formerly the administration of the mining company, now the Municipal museum), a miner's theatre, a school building. The second part, about one km from the city centre, is the smelting plant, which needs to be reconstructed. It can only be visited from the outside. The third part is located at the outskirts of Idrija close to the historic entrance of the Joseph's Shaft and comprises of a large water wheel (Kamšt) from 1790 and a water channel (Rake). But beware: the pump house is not regularly open, you have to ask for a guided tour at the museum. Unfortunately, we missed that. A trail leads alongside the Rake water channel through a nice forest with beeches and firs and ends after 3 km at the Kobila dam and the Wild Lake (Divje jezero). The dam and the Rake channel were used to regulate the water flow for the drive of water wheels and the transport of tree trunks that were used for supporting the mine tunnels. The final parts of the site are four water barriers (klavže) on the Idrijca and Belca river. If you continue on the hiking trail at the Wild Lake, you would reach two of the water barriers after about 12 km. But this was a bit too far, so we decided to return and tried to go as far as possible by car. 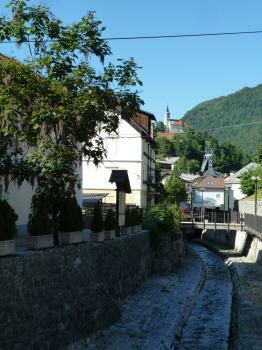 First, we drove on an asphalt road to Idrija Bela, a small village with a few houses, where you can bathe in the river. Then, after one kilometre the road became bumpy and narrow. We parked our car and went further by foot. After about 5 kilometres (moderatly uphill along the Belca) we reached the first water barrier, the Brusove klavže (photo), and after another kilometre the Putrihove klavže. These klavže are massive locks built of stone, which at a first glance appear a bit oversized for the small river. They were used to dam water and when enough water had accumulated, the locks were opened to allow the water to transport the wood downhill. The klavže are accessible, you can walk on the stone walls and go downstairs to the watercourse. I enjoyed our short hike through the beautiful forest scenery and the klavže are really impressive. There is a lot to entertain visitors for a whole day, and Idrija offers enough for every taste: a mine, historical technical equipement, a pleasant town, a rewarding museum, and in fine weather the nice landscape contributes much to the pleasure of the visit. “…and if I hire a car I could make it to the disused mercury mine!” little did I know that this ‘obscure’ holiday destination that I was trumpeting in the pub would prove to be such a rewarding target. I drove to this site fresh from landing at Trieste airport, initially just assuming I would be getting in a pre-emptive tick on a site that was soon to be inscribed on the World Heritage list and little else. It actually turned out to be an exceptionally rewarding way to start my holiday in this great little corner of Europe. Idrija is situated in a wonderfully verdant valley and the road through it was a pleasure to drive. When I arrived at the town I was suitably impressed. Rather than being the slightly utilitarian mining landscape I was expecting it was actually a rather pretty Central European renaissance town. There were lovely winding streets, trickling streams, a little white church nestled above the town and an imposing arcaded castle housing the wonderful town museum. I arrived just too late for a tour of the mine shafts, so headed for the museum which was exceptionally well presented, and the staff were superb. They gave me an introduction to the life of the town, its heritage and its highlights. There were displays on mercury (including a bowl full of it with an iron canon ball floating atop it), mining, technology, local art, WWI, socialism and lace. Actually the Lace display proved to be very interesting, as it rounded out the life of the town, whilst the men were down the mines the women were making lace. It also prepared me for the Lace festival which had taken over the main squares and provided a great ambiance. After soaking up the atmosphere and enjoying a plate of local speciality žlikrofi, I drove of north through the even more beautiful Soèa valley seeing the Julian alps rise around the astounding emerald blue waters. 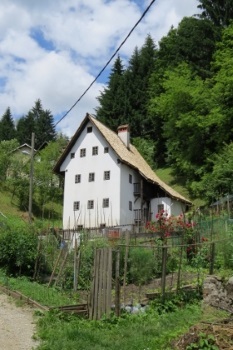 It looks likely that Idrija will be added to the World Heritage list in 2012 alongside Almadén in Spain. I’m not really sure how much of a link there is between these two towns aside from the large mercury mines, however if Almadén is half as rewarding as Idrija, then I would thoroughly recommend a visit. 4.0: Philipp Peterer Antonio J. Water wheels: Kamst Water Wheel in Idrija, the "biggest still preserved wooden water wheel of this type in Europe"
Prison: Almaden - "After the Fuggers failed to meet production quotas in 1566, the King of Spain agreed to send 30 prisoners to serve their sentences as laborers at Almadén. The number was increased to 40 in 1583. The prisoners, known as forzados, were selected out of criminals waiting for transport to the galleys in the jail of Toledo. Those selected usually had limited sentences and good physical abilities. Murderers and capital criminals were rarely selected, as the galleys were considered a far harsher punishment than the mines of Almadén" Wiki) There are some remains of this period " the prisoner gallery where the criminals were led to work in the mine from the prison." and location 1313rev-003 are the archaeological remains of the "Royal Forced Labour Gaol"
Built or owned by Germans: Idrija's Town Hall was built by German-born architects Clemens M. Kattner and Gustav Adolf König. Reduced from broader TWHS: TWHS originally included the Camino Real and San Luis Potosi, which were separately inscribed.